Summary. The article highlights the main legal and ecological peculiarities of the Ukrainian lands use with the aim of ensuring of sustainable land management during the process of the European integration. Since the beginning of 2019 land will be considered as a subject of commercial bargains in Ukraine, which means new level of land use management towards the Sustainable Development of Ukrainian Agriculture. Opening of the land market in Ukraine can have both: negative and positive results. It means that legislation towards sustainability protection is on first priority. According to the Association Agreement between European Union and Ukraine the purpose of co-operation in the sphere of agriculture and the agro-industrial sector shall be the pursuance of agrarian reform, the modernization, privatization and restructuring of agriculture, the agro-industrial and services sectors in Ukraine, development of domestic and foreign markets for the Ukrainian products, in conditions that ensure the protection of the environment, taking into account the necessity to improve security of food supply. Land resources of Ukraine are quite large in comparison with many European countries. Total land area of Ukraine is 60 million hectares and about 42 million hectares belong to the agricultural land. Therefore, there are a lot of issues, which have to be solved and planned, are arising in relation to the appropriate sustainable land management for the agrarian use. The United Nations defines sustainable land management as the use of land resources, including soils, water, animals and plants, for the production of goods to meet changing human needs, while simultaneously ensuring the long-term productive potential of these resources and the maintenance of their environmental functions. This article is dedicated to environmental protection of Ukrainian lands, namely: 1) protection of soil of Ukraine, which is suffering from erosion and other negative impacts; 2) rational purposes of agrarian land use. Key words: DCFTA, European integration of Ukraine, land use management, sustainable development. Introduction. In 2014 the European Union and Ukraine signed an Association Agreement (hereinafter referred to as the AA) that constitutes a new state in the development of EU-Ukraine contractual relations, aiming at political association and economic integration. According to the AA the purpose of co-operation in the sphere of agriculture and the agro-industrial sector shall be the pursuance of agrarian reform, the modernization, privatization and restructuring of agriculture, the agro-industrial and services sectors in Ukraine, development of domestic and foreign markets for the Ukrainian products, in conditions that ensure the protection of the environment, taking into account the necessity to improve security of food supply. The Parties shall also aim at the gradual approximation of Ukrainian standards to Community technical regulations concerning industrial and agricultural food products including sanitary and phytosanitary standards . Therefore the issue of agrarian reform in Ukraine due to the Euro integration aim of our country is in first priority. Analysis of recent research and publications, raising the problem. Strategic vectors towards partnerships for sustainable development of agrarian sector are widely studied by such domestic and foreign scientists, as Myakishev I., Pankiv Z.P., Tretyak A.M., Andriychuk V.G., Peter Motavalli, Kelly Nelson, Ranjith Udawatta, Shibu Jose and Sougata Bardhan and others. Purpose and objectives of the study. The purpose of the article is to study the issue on the development of the land use management in Ukraine with the concentration on sustainability, which means that the aim of agricultural sector of economy should cover environmental and social constituents parts. For this purpose the author. Materials and research methods: comparative legal; sociological; logical; dialectical methods are used during this study. Results: the analysis shows, that the current legislation concerning land use management is dedicated to trade system and achieving the highest economic results from the agrarian sector with using the most modern technics. However, to produce grain, it is not enough merely using farm machines , a conscious approach with an understanding of the proper allocation of resources to future generations is vital. Discussion of results. The AA includes provisions for a Deep and Comprehensive Free Trade Area (hereinafter referred to as the DCFTA). The DCFTA offers Ukraine a framework for modernising its trade relations and for economic development by the opening of markets via the progressive removal of customs tariffs and quotas, and by an extensive harmonisation of laws, norms and regulations in various trade-related sectors . This will create the conditions for aligning key sectors of the Ukrainian economy to EU standards. According to the Article 289 from the Chapter 13 of AA “Trade and sustainable development” the Parties recall Agenda 21 on Environment and Development of 1992, the Johannesburg Plan of Implementation on Sustainable Development of 2002 and the internationally agreed policy agendas in the employment and social policy fields, in particular the International Labour Organization (hereinafter referred to as the “ILO”) Decent Work Agenda and the 2006 Ministerial declaration of the UN Economic and Social Council on Full Employment and Decent Work. The Parties reaffirm their commitment to promoting the development of international trade, in such a way as to contribute to the objective of sustainable development and to ensuring that this objective is integrated and reflected at every level of their trade relationship. To this end, the Parties recognise the importance of taking fully into account the economic, social and environmental best interests of not only their respective populations, but also future generations and shall ensure that economic development, environmental and social policies are mutually supportive . Sustainable development policy aims to achieve a continuous improvement in citizens’ quality of life and wellbeing. This involves the pursuit of economic progress while safeguarding the natural environment and promoting social justice. The economic, environmental and social dimensions are all part of the EU Sustainable Development Strategy (EU SDS) adopted in 2001 and renewed in 2006 . The United Nations defines sustainable land management (SLM) as “the use of land resources, including soils, water, animals and plants, for the production of goods to meet changing human needs, while simultaneously ensuring the long-term productive potential of these resources and the maintenance of their environmental functions” . Land resources of Ukraine are quite large in comparison with many European countries. Total land area of Ukraine is 60 million hectares and about 42 million hectares belong to the agricultural land with the gardens, cultivated land, vineyards and pastures . Ukraine owned 32 million hectares of black soil before the beginning of the war actions in 2014, which is one-third part of the Europe’s black soils . As the population grows, the indicator of land provision is decreasing. Therefore, it is necessary to improve the quality of land resources constantly, to use them thoroughly, without allowing unjustified withdrawal of agricultural land for the needs of other sectors of the national economy . According to Land Code of Ukraine land is not considered as a subject of any commercial bargain until the end of 2018 , which can have both: positive and negative consequences for sustainable usage of Ukrainian lands due to the existing of current ecological problems. It is estimated, that the human footprint has affected 83% of the global terrestrial land surface and has degraded about 60% of the ecosystems services in the past 50 years alone. Land use and land cover (LUCC) change has been the most visible indicator of the human footprint and the most important driver of loss of biodiversity and other forms of land degradation . There are 57.5% of the soils suffering from erosion on the territory of Ukraine. Thus, about 1.7 million hectares (4.1% of the total area of agricultural land) are under the conditions of wind erosion and 13.3 million hectares (32%) of water erosion, and more than 2 million hectares of land (4.8%) are under the conditions of a joint influence of water and wind erosion. Insufficient level of organic and mineral fertilizers leads to a deficit of nutrients in soils . Thus, the problem of the land protection from natural factors is the main for nowadays. Besides, land use management includes rational purposes of agrarian land use. For instance, in 2010-2012, about 870 million people were suffering from food insecurity, representing about 12.5% of the world population, or around one in eight people in the world. The vast majority of these people, 850 million individuals, live in developing countries, representing 15% of the population of such countries. After more than two decades of rising commercial food imports and food aid, the region is now experiencing a deep economic malaise, with growing balance-of-payment deficits and external public debts. The world economic recession has imposed a severe constraint on Africa's export-oriented economies . At the same time there are about 600 commercial tobacco growers in South Africa operating on approximately 13 800 hectares of land. These lands should be used for growing seasonable grains, appropriate for African climate to produce food for African population and decrease the level of hungry citizens. Conclusions. Accordingly “opening” of the land market in Ukraine can have both: negative and positive results. It means that legislation towards sustainability protection is on first priority. Inappropriate use of land resources leads to the fact that Ukrainian black earths lose their properties, are simply weathered and washed by water, which, accordingly, leads to a deterioration of the quality of land resources in Ukraine. Therefore, the issue of rational use of land resources and the issue of their protection is important. Bhaktivedanta A.C. Swami Prabhupada. (1995) Shrimad Bhagavatam. BBT, Canto 4. Chapter 4. Text 18. EU Sustainable Development Strategy (EU SDS). Council of the european union. Brussels, 9 June 2006. 10117/06 [available at: http://register.consilium.europa.eu/doc/srv?l=EN&f=ST%2010117%202006%20INIT]. Communication from the commission to the european parliament, the council, the european economic and social committee and the committee of the regions. Action Plan for the future of Organic Production in the European Union /* COM/2014/0179 final. 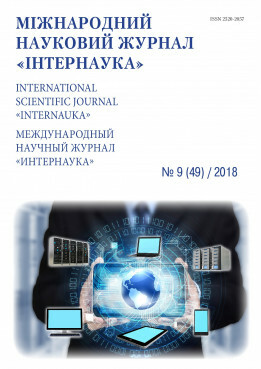 [available at: https://eur-lex.europa.eu/legal-content/en/ALL/?uri=CELEX%3A52014DC0179]. Tretyak A.M. Land resources and their usage. Zemelni resursy ta ih vykoristannya. – К., 2003. – 143 p.
Andriychuk V.G. The economy of agrarian enterprises. Economica agrarnyh pidpryemstv. Textbook. K , 2002, 624 p.
Pankiv Z.P. Land resources. Zemelni resursy. Lviv, 2008, 272 p.
Peter Motavalli, Kelly Nelson, Ranjith Udawatta, Shibu Jose and Sougata Bardhan. Global achievements in sustainable land management (2015). International Soil and Water Conservation Research, Volume 1, Issue 1, June 2013, Pages 1-10. Myakishev I. Problems of Ukrainian soil science. Problemy ukrainskogo gruntoznavstva. Chernivtsi, 2001. Samar Hassan Al-Baguri. The Problem of Food Insecurity in Africa / African Perspectives, Volume 12 - Issue 41 – 2014. Tobacco. Production guideline (2015) Department of Agriculture, Forestry and Fisheries [available at: http://www.daff.gov.za/Daffweb3 /Portals/0/Brochures%20and%20Production%20guidelines/tobacco%20production%20guideline%20publication.pdf].